John Madden's pulse-pounding espionage thriller is on its way to Blu-ray this December. In an early announcement to retailers, Universal Studios says 'The Debt' will have a Blu-ray release on December 6. The movie stars Helen Mirren, Tom Wilkinson, and Ciaran Hinds as former secret agents whose past mission from 1965 hunting down a Nazi war criminal comes back to haunt them. The film co-stars Jessica Chastain, Marton Csokas, and Sam Worthington as their younger counterparts. 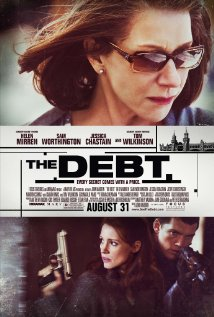 The Blu-ray will feature 1080p video, a DTS-HD Master Audio 5.1 soundtrack, and supplements include A Look Inside The Debt; Every Secret Has A Price: Helen Mirren in The Debt; The Berlin Affair: The Triangle at the Center of The Debt; and Feature Commentary with Director John Madden and Producer Kris Thykier. You can find the latest specs for 'The Debt' linked from our Blu-ray Release Schedule, where it's now indexed under December 6.